A temporary sign providing street directions (e.g. E. Mill, Vine, etc.) 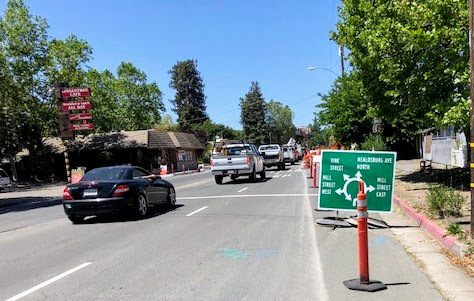 has been placed south of the roundabout for north-bound traffic on Healdsburg Ave.
Place interlocking pavers – this work will continue through most of next week. Place lithocrete A and B. Build stone wall “B” – this work will continue into the week of June 11. Install irrigation and top soil – this work will continue into the week of June 11. Next week: Sub-contractor to install irrigation system – this work will continue into the week of June 11. This week: Installed 4-ft metal fence. Week of June 11: Sub-contractor to install irrigation system. This week: Finish truck apron. Next week: Backfill area with topsoil. Week of June 11: Place cobble through the circle; the cobble represents a dry stream path. Completed demolition of old pavement to prep for the installation of curb, gutter and sidewalk in this area. Sub-graded and rock-graded curb and gutter. Form and pour bus pad. Next week: Demolish old curb, gutter and sidewalk. Excavate area and place structural soil.